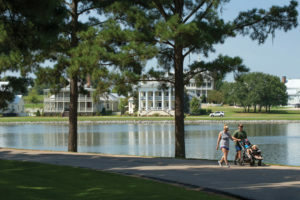 One of Alabama’s newest communities already has built the sense of community that places it among the most appealing in Alabama. 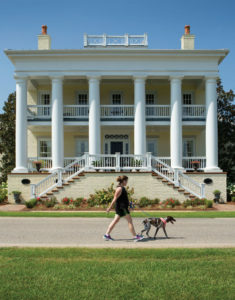 The Pike Road community first emerged as 20 new and historic neighborhood developments, created and built on agricultural land adjacent to the City of Montgomery. When the area incorporated as a town in 1997, it had only 350 residents. Now the fast-growing area is home to more than 9,000 people in 70 neighborhoods, says Mayor Gordon Stone, who was first elected in 2004. Stone points to the residents’ vision and energy as the driver behind the community’s success. The town has gone through two intensive growth reviews with significant input from residents working in study groups and idea sessions. Those efforts produced two comprehensive plans, the second a thorough update. “We want to keep looking and planning for where we are going for the next 20 or 25 years,” Stone says. The town officially adopted its “Four Pillars” for growth more than a decade ago. Those pillars are planning, education, quality of life and services. “Our community had the opportunity to start organizing from scratch, benefitting from being able to study what had worked and what hadn’t in other communities,” he says. Pike Road’s current plan is to encourage developers to create small community commercial centers in the seven distinct neighborhood areas of its 160 square miles, Stone says. A 30-mile walking and jogging trail is nearly complete. Kathy Hagood and Robert Fouts are freelance contributors to Business Alabama. She is based in Homewood and he in Montgomery.